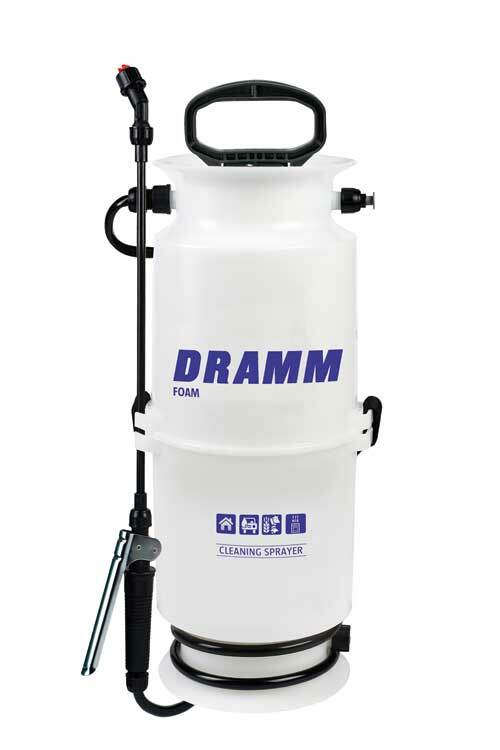 Manitowoc, WI- Dramm is pleased to offer the NEW Dramm FOAM8L Compression Foamer. The FOAM8L offers a rich, thick foam that sticks to surfaces and degrades slowly, increasing contact time for surface disinfection. Working like a standard compression sprayer, the chamber is pressurized using a hand pump, creating pressure to propel the spray solution. The FOAM8L works differently. When the trigger is released, the solution is mixed with the compressed air using a special valve. Unlike siphoning foamers that use atmospheric pressure to add air to the liquid to create a sudsy foam, the FOAM8L uses the compressed air from inside the tank, adding more air and creating a richer foam. The FOAM8L creates a rich, aerated foam that will adhere to vertical surfaces, improving contact time and helping to disinfect walls and crevasses. The FOAM8L can hold up to 5 liters (1.3 gallons) of solution and comes with three different valve options allowing for wetter or dryer foam choices. Learn more about the FOAM8L and watch videos of the foamer in action online.